Advent is the time during the Christian church year that believers commemorate the first coming (birth) of Christ while also anticipating his second coming. Why am I writing about Advent during Holy Week? Because I see a relation between the two seasons. Both are times to reflect on the life, purpose and work of Christ. During Advent, we reflect on this idea referred to as the “already/not yet” reality. It means that we’ve already experienced the presence of Christ in his birth and incarnational ministry. But we’ve not yet experienced his second coming. Last year, during Advent, I preached a sermon that presented the Advent themes through images from my trip to the Middle East. As I begin to walk through Holy Week, I find myself reflecting more and more on the experiences and images from my trip. So I wanted to share them with you. This is Anaphora, a desert retreat center located about an hour outside of Cairo, Egypt. The center is connected to the Coptic Church and is the dream of Bishop Thomas, who you’ll hear about next. Anaphora provides space for meetings, trainings and workshops – all at no cost. Those who come for a stay – whether for three hours or three weeks – have the option of paying what they are able or volunteering hours to the center. All around the grounds, all you see is desert. There was no water, so they treated the grounds and built their own canals. However, even though the grounds were treated, all you still see is desert. Bishop Thomas told us that it’s a visible reminder that, though our transformation may not always be visible to others, we shouldn’t doubt that a transformation has occurred. That, to me is hope. Bishop Thomas’ story is a little too long to share in detail – it could be a blog post all on its own! In short, he had an experience as a child that impacted him so strongly that he carried it with him into adulthood. His desire for Anaphora was to create a place that made it clear that the there was room at the table for everyone, regardless of their station in life. Everything about this man of God, from his words to the way he carries himself, is a personification of love. As we entered Israel through one of the checkpoints, some members of our 30+ person group were singled out and harassed by officials. Two members were told that they couldn’t enter and had to come back in the morning. It was emotionally painful to board our tour bus and head to our hotel, knowing that two of my friends were not with us. The tour guide explained that once they crossed the border in the morning, he would send a car for them, and they’d join us wherever we were. The next morning, we began visiting holy sites. While I was in awe, there was still an ache in my heart as I worried about my two friends. I know that others in our group felt the same. Finally, we got word from the tour guide that our friends had made it through the checkpoint. He said that they would probably be with us by lunch time. I experienced an “already/not yet” moment of my own. I was happy to hear that my friends were safe and would be joining us, but it wasn’t the same as having them actually with us. This photo was taken shortly after our small group within the large group was reunited. This is joy. The dove is a universal symbol of peace. Yet, this dove is wearing a bulletproof vest and has a bulls-eye on its chest. This is not far from the Church of the Nativity, the church that was built to protect/commemorate the place where Jesus was born. The church is on the “wrong” side of the separation wall in Israel/Palestine. But this seems fitting because it’s a reminder that Jesus was born into occupation, and violence was a regular part of his lived experience. And he, the Prince of Peace, most definitely had a bulls-eye on his chest. As we walk through Holy Week, let’s remember the land that Jesus called home. 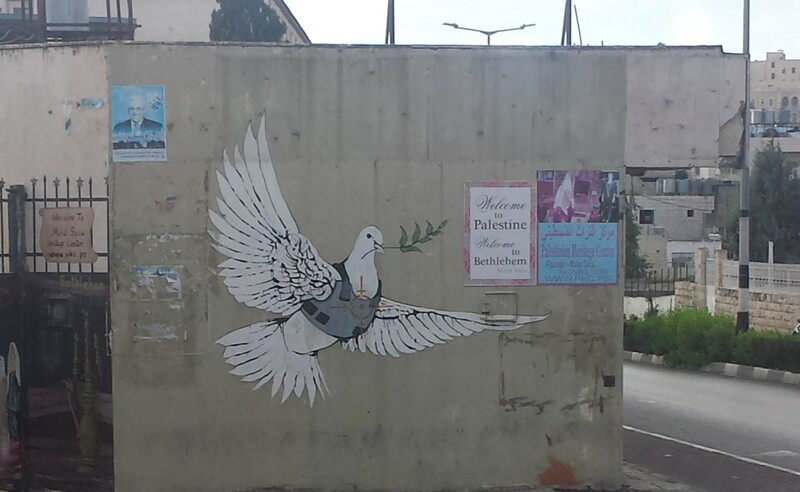 May this dove be a reminder to you to pray for peace/salaam/shalom in this land. Pray for the believers to have a renewed sense of hope, love and joy – especially as Arab Christians are fleeing the Middle East in staggering numbers. Lastly, don’t forget that all humans are made in the image of God (imago Dei). So pray for your fellow image bearers.